Last Christmas, my husband's co-worker gave us some homemade teriyaki sauce. This is the second Christmas that she has given this to us, and I am already looking forward to next Christmas' present. Needless to say, it tastes soooo good. It has the perfect blending of garlic, soy sauce, sugar, and whatever else she puts in there. I am sorry that I do not know how to make this marinade, but I promise you I will try to learn it. 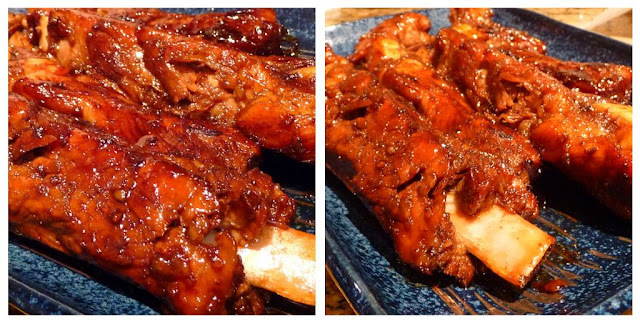 A good substitute is Kikkoman's Teriyaki Baste & Glaze. I think that comes the closest. You just might have to add some chopped up fresh garlic to Kikkoman's sauce. Keep this as a staple in your fridge and you can have a quick dish for last minute guests. 1. Tenderize the ribs on low heat by boiling for about 1 hour to 1 hour and 15 minutes. Prick the meat with a fork to check desired tenderness. 2. 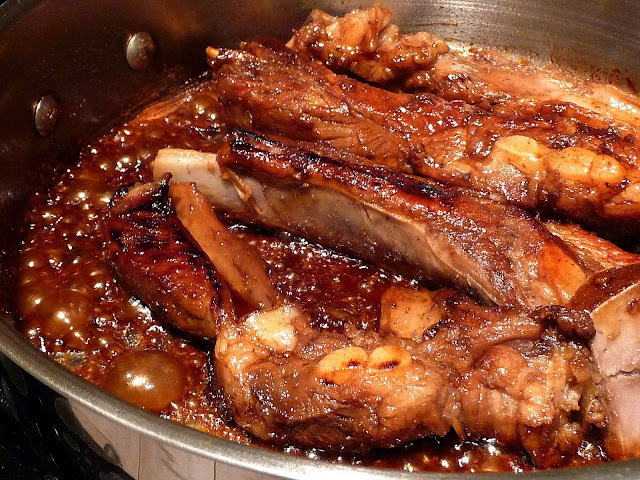 Remove meat from pot and marinate in Teriyaki sauce for about 30 minutes. You will probably use close to half a bottle. Thin the teriyaki sauce with a little bit of water until slightly runny. 3. Heat up about 1 tablespoon of oil in a pan. Brown the ribs on all sides on high heat. Add the marinade. Stir the ribs well into the sauce until it thickens and adheres to the ribs. Serve immediately. The ribs cooking in its marinade. Tender, juicy, tasty, fall off the bone goodness.